Oak trees (Quercus spp.) are more abundant and diverse in species than maple trees (Acer spp.) in Georgia. Both oaks and maples can be found in a wide range of locations in Georgia, from the coastal regions to the mountains. About 13 different species of oak trees are found growing in Georgia, while only six species of maples grow natively in the state. 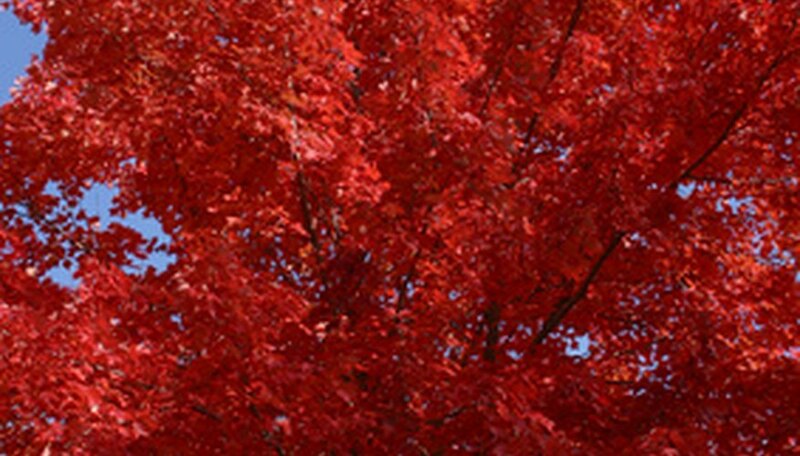 Due to the warmer climate zones in Georgia, some of the oak tree species are semi-evergreen in the state, but the maples put on a more vibrant color display in autumn. Identify the chestnut oak (Quercus prinus), also called the rock oak, growing in Georgia by its non-lobed, shiny dark-green leaves that have lighter-green undersides and turn yellow or orange-yellow in fall. The leaves have rounded teeth along the edges. 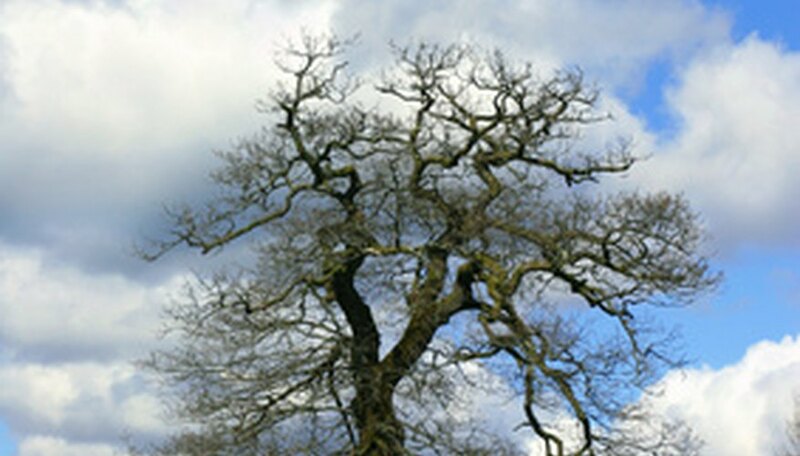 The mature chestnut oak has gray bark with deep, V-shaped ridges and 1- to 1 ½-inch-long acorns growing on short stalks. Look for leaves that are similar to the chestnut oak but have grayish-green, felt-textured undersides to identify the swamp chestnut oak or basket oak (Q. michauxii). The swamp chestnut oak’s bark is light-gray with rough, flaky ridges and its leaves turn dull-red to maroon in fall. This oak tree produces 1- to 1 ½-inch-wide acorns in abundance. Spot the scarlet oak (Q. coccinea) growing in poor soils, dry uplands and on slopes in Georgia. 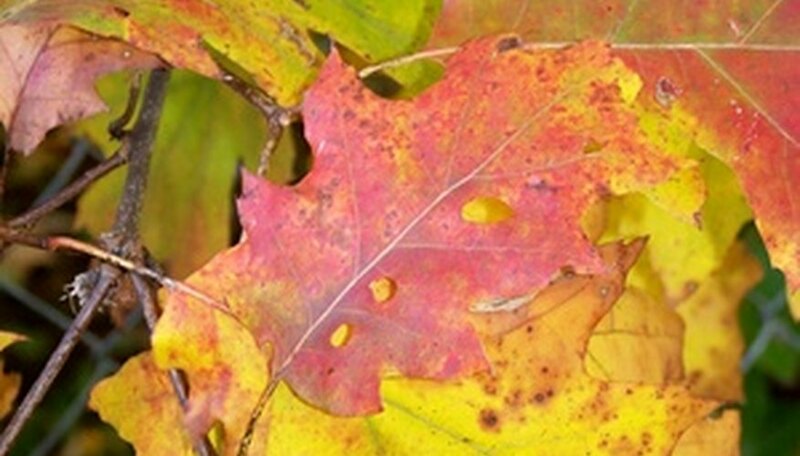 The scarlet oak has deeply-lobed, 3- to 5-inch-long leaves with bristle-like tips that turn vibrant scarlet-red in autumn. The scarlet oak tree produces small, less than 1-inch-long acorns that are light-brown and have a cup that cover half of the nut. 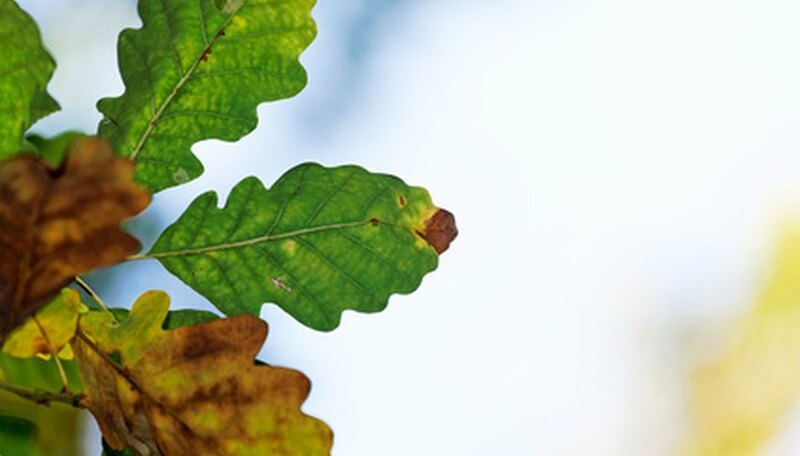 Look for shiny green leaves with three to five bristle-tipped, deep lobes and yellowish-gray undersides to identify the Southern red oak (Q. falcata), also called the Spanish oak. The Southern red oak has deeply-fissured, rough and ridged bark that’s brown to black on the outside and orange inside. 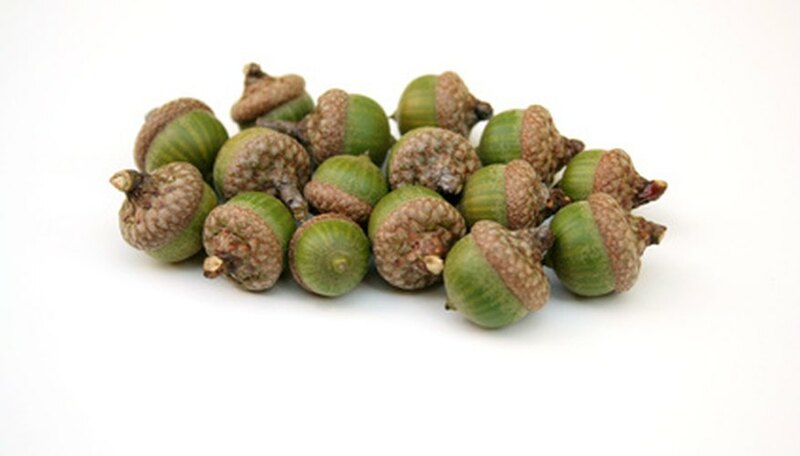 The round acorns are up to 1-inch long and grow on short stalks, with shallow cups. Identify the Shumard oak (Q. shumardii) growing beside rivers and streams in Georgia, but not in the northeastern portion of the state. The Shumard oak has deeply-lobed, bristle-tipped, large leaves that have woolly hairs at the leaf axils. The acorns are shallowly-cupped, 1- to 1 ½-inches long and grow on short stalks. Identify the live oak (Q. virginiana) by its non-lobed, oval leaves and nearly black, alligator skin-like bark. The live oak is nearly evergreen, only dropping its leaves in spring right before the new leaves emerge. This oak is found in Georgia often covered in Spanish moss and resurrection ferns, with huge horizontal branches and a broad, spreading form. 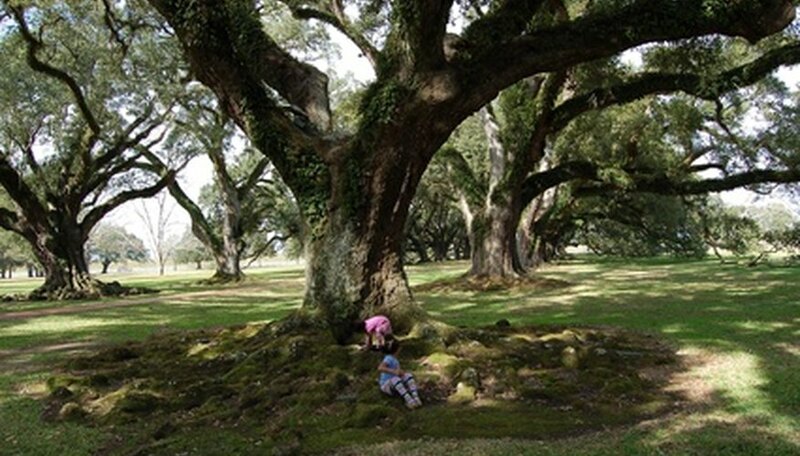 The live oak grows up to 80 feet tall and 100 feet wide. Spot the Northern red oak (Q. rubra) growing in a wide variety of locations in Georgia, with shallowly-lobed, bristle-tipped, thin leaves that have pointed, narrowed lobe tips. The leaves are shiny dark-green and yellowish-green on the undersides, turning yellowish-brown to rust-red in the fall. The oblong acorns are less than 1-inch long with a shallow cup. Look for round-lobed leaves without bristle tips with the three end lobes smaller than the others to identify the post oak (Q. stellata). The leaves are rough and dark-green on the upper surfaces and grayish-brown on the undersides, turning golden-brown in fall. The acorns are less than 1-inch long with light-brown nuts and cups that cover about one-third of the nuts. The post oak has gray bark with scaly ridges and shallow fissures. Study the elongated, teardrop-shaped leaves that are alternately-arranged on the stems to spot the water oak (Q. nigra), which can be found growing beside streams throughout Georgia. The dime-sized acorns are dark-brown and round, with shallow cups. The water oak is semi-evergreen, keeping its leaves throughout the late fall and winter during mild winters in Georgia. This oak grows up to 50 to 80 feet tall and 25 to 40 feet wide. Identify the white oak (Q. alba) by its bluish-green, deeply-lobed leaves that have small, thin lobes without bristle tips. The white oak produces less than 1-inch-long acorns that have warty, swollen scales on the cups. The white oak is the most common oak tree in northern Georgia, but is less common in the southern portion of the state, with wine-red autumn leaves and a mature height of up to 100 feet. Spot the turkey oak (Q. laevis) by its distinct, crooked branches and smaller size, growing up to only 30 or 40 feet tall at maturity. The leaves are three-lobed and tend to resemble turkey feet, turning bright-red in fall. The turkey oak has block-patterned bark and most commonly grows in the sand hills of coastal Georgia. Identify the red maple (Acer rubrum) in Georgia by its three-lobed, 2- to 6-inch-wide leaves that have small, sharp teeth along the edges and a whitish tint to the leaf undersides. 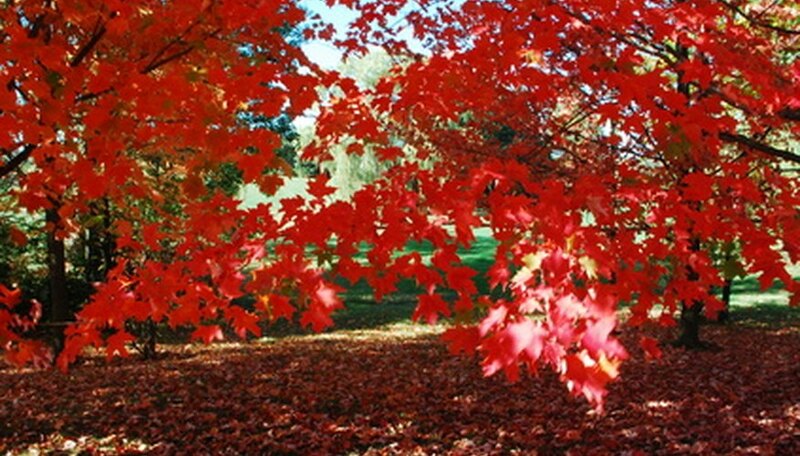 The red maple has V-shaped, double-winged “fruits” that mature in spring and are about ½- to 1-inch long. Mature red maple trees have narrow, scaly plated bark with gray or black ridges. Spot the silver maple (A. saccharinum) growing in northern and western Georgia. The silver maple has five-lobed, 5- to 7-inch-wide leaves with light-green upper surfaces and silvery-white undersides, along with finely-toothed edges. 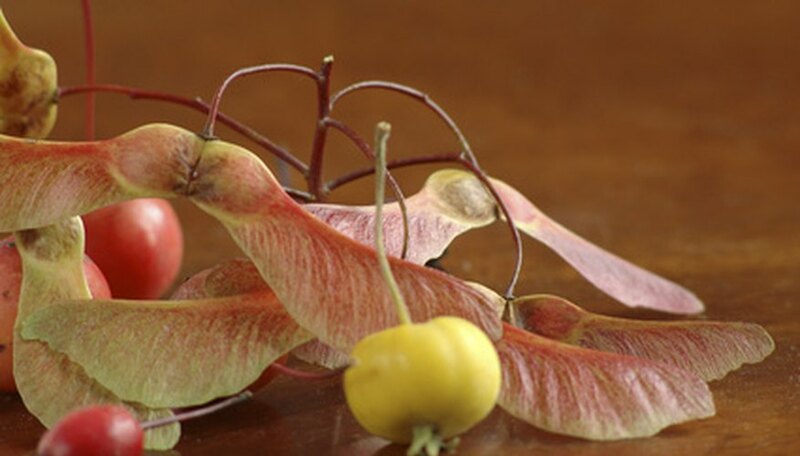 The silver maple’s fruits resemble the red maple’s seed pods, but they’re larger, about 1 ½- to 2-inches long. Mature silver maples have bark breaking into thin, long scaly plates with a red tinge in the bark pattern. Look for seven-lobed leaves without teeth on the edges that grow opposite each other in pairs on the branches to identify the Norway maple (A. platanoides). The Norway maple is an exotic, ornamental tree with double-winged, 1 ½- to 2-inch-long fruits with widely-parted wings. The bark is grayish-brown, becoming rough and developing into narrow ridges on mature trees. Identify the sugar maple (A. saccharum) by its five-lobed, 3- to 5-inch-wide leaves that are bright-green on the upper leaf surface and pale-green on the undersides. 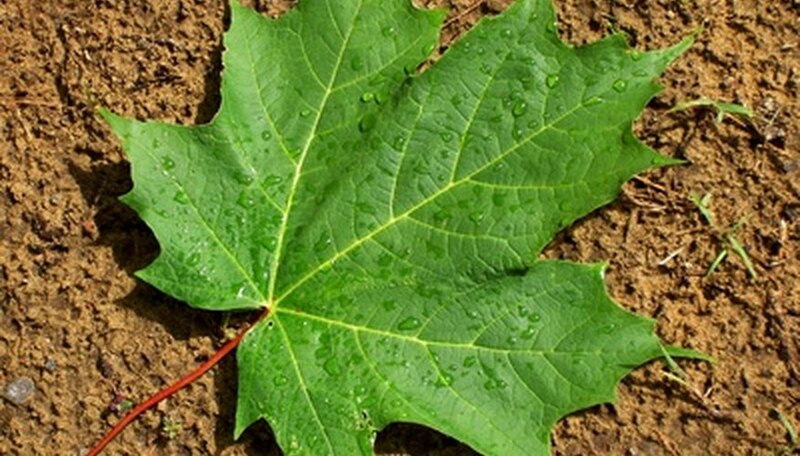 Unlike the red and silver maple trees, the sugar maple’s leaves don’t have fine teeth on the edges. In the fall, the sugar maple produces horseshoe-shaped, double-winged fruits with parallel wings that are about 1-inch long. The sugar maple’s leaves turn brilliant yellow, orange and red in autumn. Look for a maple tree with a rounded to spreading canopy that may appear to be pyramidal in shape when the tree is young to identify the Florida maple (A. barbatum), also called the Southern sugar maple. The Florida maple grows 35 to 40 feet tall and 25 to 35 feet wide, with five-lobed, hand-shaped leaves and smooth, gray bark. The leaves turn yellow to orange or rust-red in autumn, but the colors are not as brilliant as the sugar maple’s fall leaves. The chalk maple (A. leucoderme), or whitebarked maple, is a smaller version of the sugar maple, grows 25 to 30 feet tall and 25 feet wide with oppositely-arranged leaves that turn bright yellowish-orange to crimson in the fall. The chalk maple has pale-gray to chalky-white bark on the upper portion of its trunk and is less common but can still be found throughout Georgia. The Laurel oak (Q. hemisphaerica) also grows in Georgia and is semi-evergreen in the southern portions of the state. 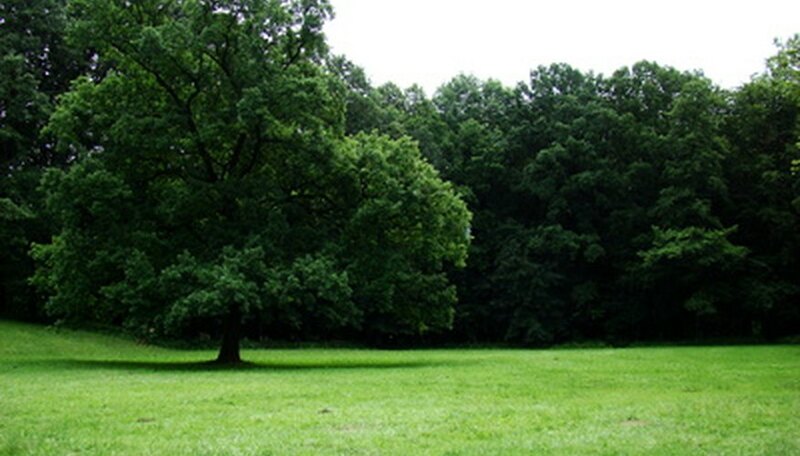 This oak tree has a broad crown and horizontal branches, reaching a mature height and spread of 60 to 80 feet. Don't mistake the Georgia oak (Q. georgiana) for the Southern red oak. Growing mostly in rocky soils and dry slopes, and only 20- to 40-feet tall and 15 feet wide, the Georgia oak tree has three- to six-lobed leaves that look like miniature red oak leaves. The leaves are shiny green on the upper surfaces and paler on the undersides, turning bright-red in fall. The acorns are also small, light-brown and with cups that cover about one-quarter to one-third of the nuts. Oplin.org: What Tree Is It? How Can I Identify Pine Trees?